I’ve wanted to try one of David Chang’s Momofuku restaurants on my last few trips to NYC, but it’s never worked out before. Reading through other blog posts and reviews, it seemed that reservations were impossible to get and that for those that didn’t take reservations, (Noodle Bar) the wait time was always an hour plus. On this trip, I really wanted to experience the Momofuku hype first-hand so I monitored the reservation system carefully so that I could learn to beat the system. And 4 weeks in advance, at exactly 10am, I logged into the system on 2 different computers, “refreshing” my screen over and over again, until I was finally accepted into a 2pm Fried Chicken reservation! 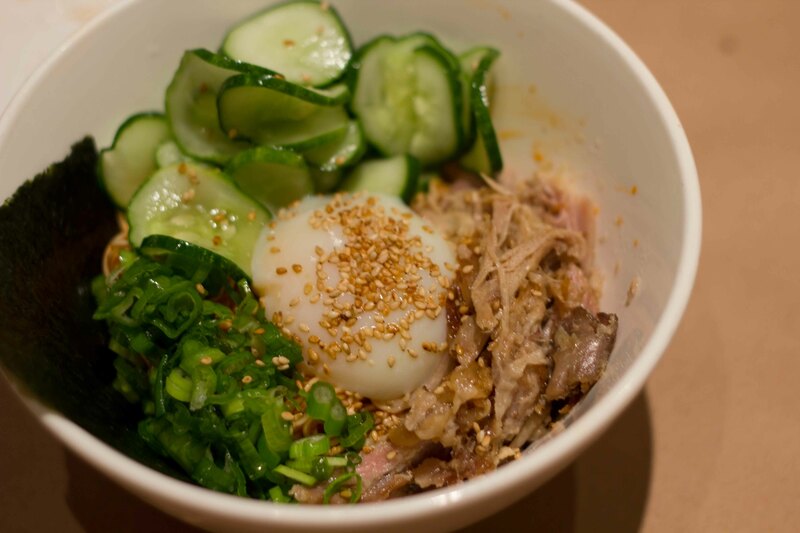 Located in the East Village, Momofuku Noodle bar is known best for their noodles, but each day they have a few seatings for groups of 4-8 for Fried Chicken Dinner. For $100, you are served 2 whole fried chickens, served 2-ways, with mu shu pancakes, a bowl of fresh veggies and 4 sauces. I had been forewarned that this amount of food would be plenty for the 6 or us, but I really wanted to sample some of the other things that the Noodle Bar had to offer. 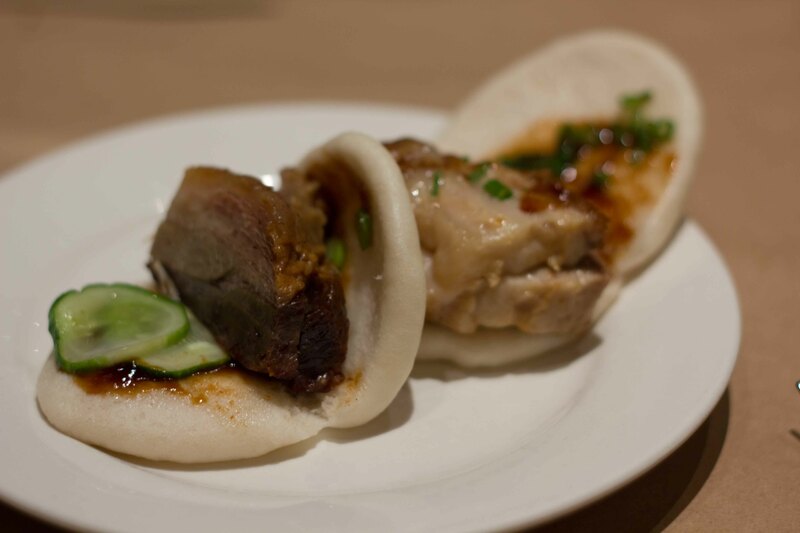 The pork buns are one of David Chang’s most talked about dishes. The wonderful pillowy soft bun is the perfect vehicle for the pork belly nestled in just the right amount of hoisin sauce. This dish was so delicious. When it was ordered I didn’t realize that it would be served with spicy thin noodles. When the egg is broken on top, you’re left with a wonderful yolk-y goodness that coated the chewy noodles. 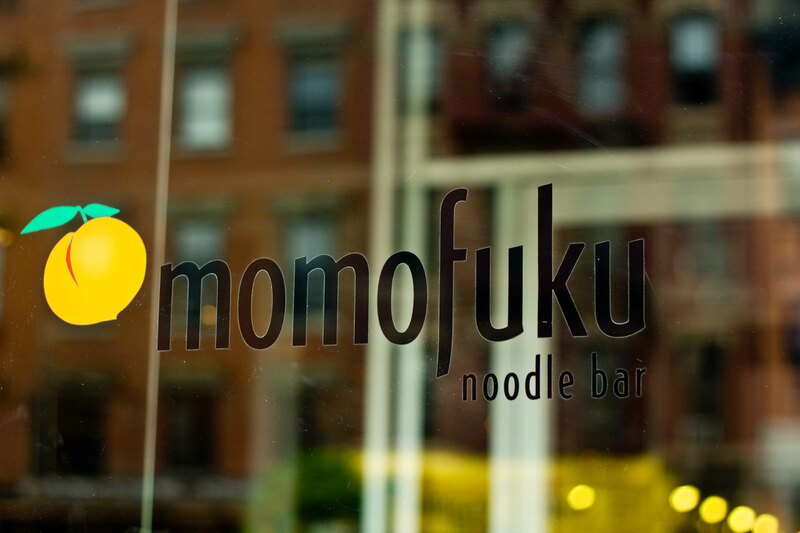 After tasting the noodles, I yearn to return to sit at the bar to try a bowl of their ramen. 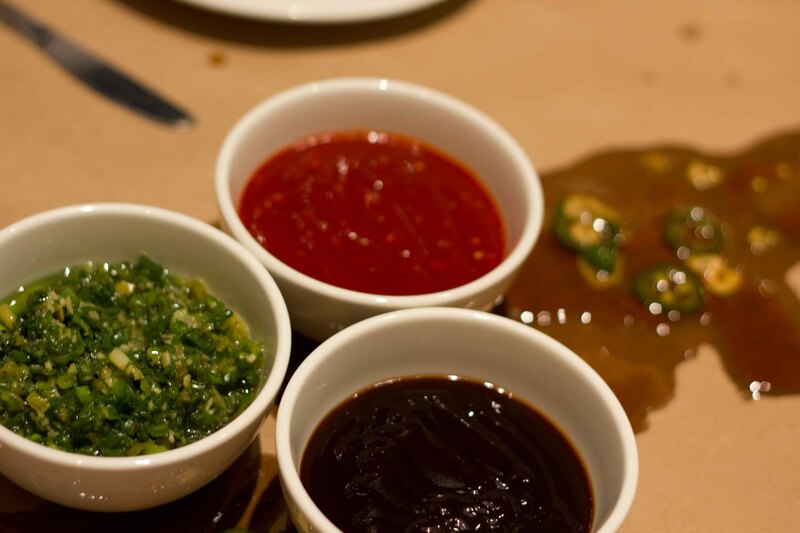 4 sauces for the chicken were hoisin, ginger scallion, bibim and spilled on the table is the soy jalapeno. 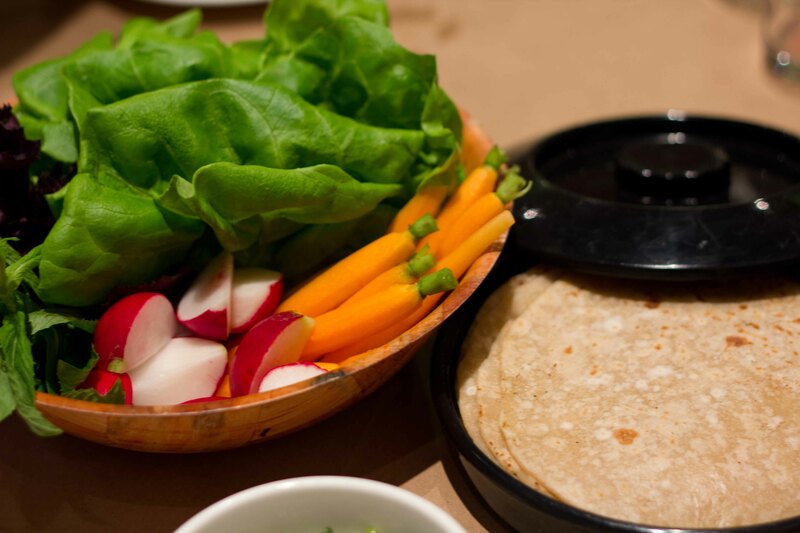 A bowl of fresh vegetables along with what was listed as mu shu pancakes but tasted more like dried out store-bought tortillas. 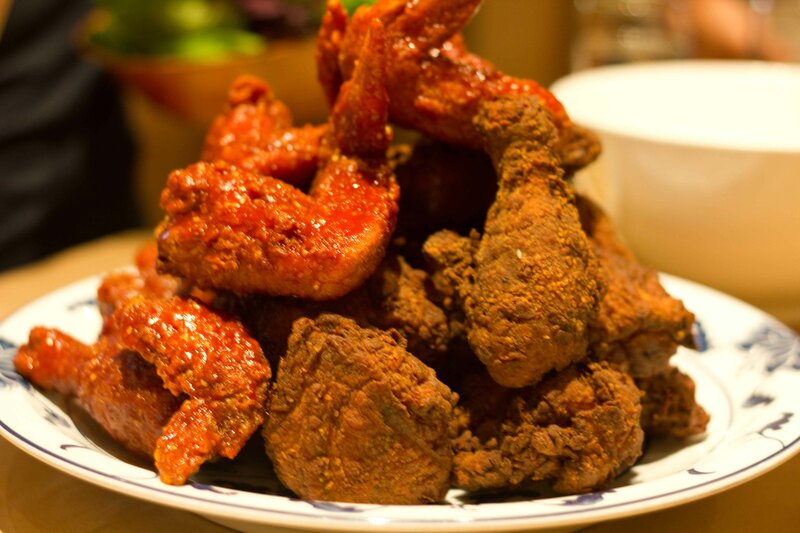 2 kinds of fried chicken – the darker on the right is the buttermilk fried chicken, with delightfully crispy skin which retained the moistness of the meat. Twice fried Korean-style chicken marinated in bibim sauce, (a sweet/hot chili paste) was the favorite around the table. I have a hard time deciding which of the 2 styles I preferred. I enjoyed the buttermilk for its crispy flavourful skin and for the fact that the meat spurted juiciness into my mouth with each bite. The buttermilk was a great traditional version of fried chicken made less traditional, but enhanced, served with the asian condiments. The Korean style was less crunchy than the buttermilk, but had a sticky crackly goodness to it. It helped too that the pieces were mostly wings which are my favourite part of a chicken. What I enjoyed most about this meal was the communal aspect of sitting around a table, eating family style and sharing a similar experience with 5 other diners. In the right company, that in it of itself can make a great meal. Throw in some tasty grub and the meal becomes epic, which this did in my mind. I was happy to share this meal with Jane & Barry, who presented me with my favourite Fried Chicken dinner years ago in Waterton, Alberta. 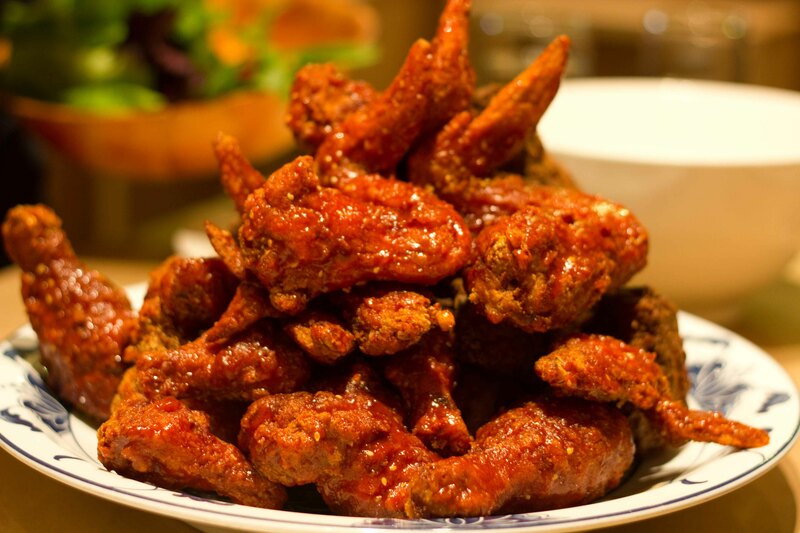 As much as I enjoyed Momofuku, the memory of seeing Barry coming around the block with a few buckets of Zum’s chicken and then devouring a few pieces of the deliciously spiced chicken still tops my fried chicken experience. Zum’s is worth trying if you are ever in Waterton, Alberta! I liked Momfuku’s a lot! It was soooo much fun and you could actually get a seat if you go past 2 or 2:30pm in the afternoon. Hey, stumbled upon your blog looking for idea’s for our new cheese plate, and different plating styles. Nice work. Especially loved the French Laundry blog. Thanks so much for your comment! I loved writing the FL post almost as much as I did eating there, (ok probably not that much).